With a wide range of banners, SpeedyPros can help you make the right choice for your application. Furthermore, our expert graphic designers are on hand with free assistance, if you need it, to make sure your custom banner makes the impact you desire. A cost-effective solution for all marketing events and opportunities, trade show displays and exhibitions, our banners are cheap to design, make and order and give a great return for your advertising dollar. A quick and easy atmosphere creator at parties, events, weddings, graduations, flash sales, sports events and real estate sales – banners never fail to make an impact. Printed in high quality, full color digital printing, our banners are the best available and we can make them in any style or configuration you require. Just talk to our consultants or pop in to see samples of our products. Portable roll up banners are great for instant displays of your products and services. Simply roll up the banner into its handy container stand when done. Showcase your full color digital printed banners with banner stands for maximum visual impact. Available in a variety of types to suit all banner sizes and configurations. Let us help you design high quality custom banners for your company or organization. Digitally printed on vinyl in full color, our custom banners have amazing visual appeal. Our cost effective banners can be used anywhere to publicize your products and services. They return your investment - many fold - with the attention and interest they attract. When you want to create great impact with movement, consider our banner flags. Available in various shapes and sizes, all printed in glorious full digital color. Pop up banners do just that! They pop up wherever you need them for an instant mini-display or show stand, getting you noticed every time. Pull up banners are easy to transport and assemble. Use several together to create a full backdrop for your stand or display. Durable, waterproof and rip resistant, PVC vinyl makes an ideal material for your banners. Suitable for all designs, vinyl gives quality results for digital printing. Rolling up into their own carry case that doubles as a stand, roll banners can be assembled almost anywhere to give you an instant banner display. A great marketing tool, especially for people on the move, retractable banners are light and easy to transport and set up anywhere they are needed. Making a solid backdrop, step and repeat banners display the advertising logos or information in a repeated pattern so that it can’t fail to be noticed. Print your photos onto vinyl banners in full digital color to create photo banners of very high resolution. Great for portraits, scenery, product information, etc. With their distinctive shape, teardrop banners catch stray breezes to move and draw attention to your company name and logo to passersby. Strong, flexible PVC banners provide high resolution print quality for your advertising that will withstand repeated use, water, wear and tear. Their razor-like shape gives them their name, but feather banners work tirelessly to display for you in all conditions, held securely by an X-stand base. When you need a big banner for potentially windy conditions, choose a mesh banner. The perforations mean it won’t tear or split and will stay intact, even in harsh conditions. Pulling up into a tall display, vertical banners will get you noticed over everybody’s heads in the busiest of gatherings. For indoor use and calmer conditions, try a printed fabric banner that will give lots of different effects. Lightweight and attractive, be different and go with printed fabric. Using a step and repeat pattern, or a large graphic image, backdrop banners provide the atmosphere for events, plays, hallways and other settings. Traditional style hanging banners can be easily suspended on walls or from ceilings, windows, or on the outside of buildings to make a great display. Fitting into a sandwich board stand, A frame banners can be placed where required. 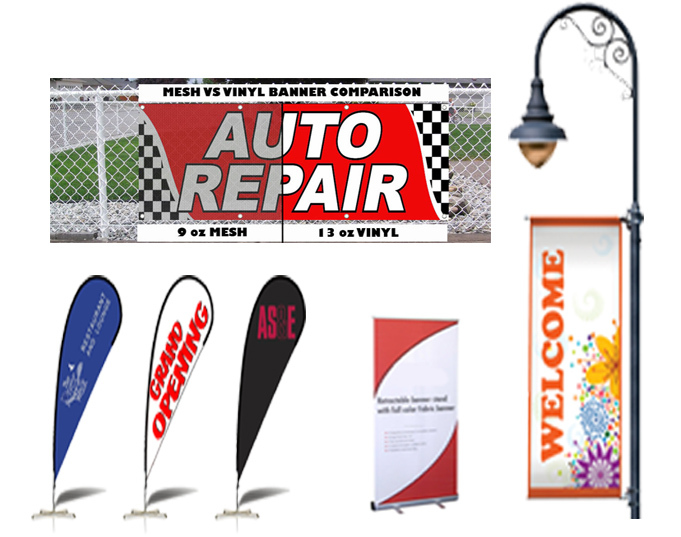 Great for sidewalks, temporary displays and point-of-sale use. Mini printed roll up or retractable banners sit easily on tables to create professional marketing and awareness in an instant, wherever you go. Smartly waving from a custom pole or telegraph pole or street lamp, pole banners add attention-grabbing graphics to a street or setting. Strong and tough, waterproof and weatherproof, plastic banners are excellent for all purpose digital printing in full color, lasting for many seasons. Order your perfect Banners from SpeedyPros now! Banners are one of the easiest signage applications to install. Use cords, strings or bungees to attach the corner grommets to a stationary object, such as poles. You can also use screws and washers to install your banners to rigid backgrounds such as wood or concrete, or you can use zip ties or string to fasten them to fences or between posts. To care for your custom banners, regularly clean them with warm water and allow them to air dry before storing. To easily store your banners, roll them up and keep them in a dry area at room temperature. Any wrinkles in your banners should come out within a couple of hours in the sun or heat.